The rectus abdominis (L. rectus, straight ; abdo, to hide) is a long muscle pair located front and center on the torso. It’s named after the straight, vertical direction of its fibers relative to the midline of the body. It acts on the spine, with its main role being the prime mover in spinal flexion. Notably, it also plays an important role spinal stability thanks in part to its role in increasing intra-abdominal press. Plus, it assists in forced expiration. 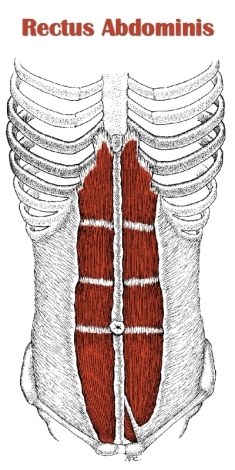 The left and right ab muscles are separated vertically by the linea alba. Three (sometimes four) tendinous intersections run horizontally across each rectus abdominis muscle. Together, the vertical and horizontal divisions are responsible for the six (sometimes eight) pack on anyone with a low enough body fat percentage. The rectus abdominis is the most medial muscle in the anterolateral abdominal wall, situated to the inside of the internal/external obliques and transversus abdominis (TVA). While the muscle itself is superficial in that it’s not covered by other muscles, it lies deep to the aponeuroses of the internal and external obliques (it is superficial to the TVA aponeurosis above the so-called arcuate line, but deep to it below the line). The rectus abdominis originates from the pubic bone. Its fibers have a parallel orientation and travel superiorly to their insertion on the xiphoid process and the 5th-7th ribs, forming a strap-like muscle architecture. Note: The table below only features exercises that target the abdominals directly. However, the abs get an intense indirect training effect from hip flexor exercises (e.g. ab wheel rollout, leg raise variations) since the abs must contract isometrically to stabilize the torso. They’re also trained indirectly in oblique exercises. Inhibited/Lengthened Rectus Abdominus: The abdominals are commonly inhibited and lengthened in people with lower crossed syndrome (LCS). The anterior pelvic tilt associated with LCS moves the lower attachment of the abs down, increasing its distance from the upper attachment. This stretches the abs out, and weakens them. At the same time, the excessive lordosis that comes with LCS facilitates the lumbar erectors, which in turn reciprocally inhibit the abdominals and cause them to become even weaker. Weak abs will negatively impact your strength on all compound movements. Your power transfer between your lower and upper body is inefficient since your ability to keep your core sufficiently tight is compromised by your weak abdominals. Inhibited/lengthened abs can lead to a number of problems higher up or further down the kinetic chain, though lower back strains and disc issues are probably the most common. Note: Although the abs as a whole are weaker, you’ll likely feel the greatest loss of control over the lower abs since the lower attachment is most affected as a result of the anterior pelvic tilt. Overactive/Short Rectus Abdominis: The abs are overactive and short in those with upper crossed syndrome (UCS). The excessive thoracic kyphosis associated with UCS depresses the ribcage and moves it closer to the pelvis, which shortens and facilitates the abs. The tight abs, in turn, reciprocally inhibit the thoracic erectors. This can cause reduced thoracic extension range of motion and making it more difficult to stand or sit with an erect posture for long periods of time. Eventually, overactive/short abdominals can contribute to shoulder injuries since the excessive thoracic kyphosis reduces overhead range of motion and impairs scapular stability. Note: If you have both lower and upper crossed syndrome (i.e. kyphosis-lordosis posture or layer syndrome), the rectus abdominis tends to be more overactive near its upper attachment on the ribcage, and more inhibited near its lower attachment on the pubic bone. Increase training volume or frequency for abdominal exercises. Although your entire rectus abdominis muscle is weak, the lower attachment is probably your weakest point in terms of muscular strength and motor control. Accordingly, you should prioritize lower abdominal exercises (i.e. reverse crunch variations). If you have excessive thoracic kyphosis in addition to lower crossed syndrome (LCS), you should avoid traditional crunch and sit-up exercises (i.e. upper ab exercises) altogether. Upper ab exercises cause the abs to contract in such a way that the upper spine flexes and the ribs move toward the hips, which is undesirable since this reinforces the excessive thoracic kyphosis. The abs and obliques work together to stabilize and move the spine. If one is weak, then odds are the other one is too. So, it’s likely that your obliques are also inhibited/lengthened. Accordingly, it’s probably a good idea to do more direct oblique training to complement your abdominal training. If your abs are weak, then your lower spinal erectors will be overactive and short. As such, you should reduce training frequency or volume on lower back exercises. Note: This doesn’t mean deadlifting less, since it’s more of a full body movement. Rather, it means to cut down on, or avoid, exercises like the hyperextension/back extension or bent-knee good morning, which focus specifically on the lower back. Increase direct glute training volume or frequency. The glutes are responsible for posteriorly tilting the pelvis (opposing the hip flexors which tilt the pelvis anteriorly). So, you need to strengthen the glutes to get back to a more neutral pelvic alignment, which will put the spine and abs into the proper position. Release and stretch the lower spinal erectors. These lower back muscles are tight and contribute to the weakness of the abs. Releasing them with self myofascial release techniques followed by some static stretching will help calm these muscles down and get them to a more normal resting length. This, in turn, will put the lower spine in a better position and allow the abs to function better. For best results, perform lower back release techniques and stretches prior to doing any ab training, as well as on a daily basis as part of a mobility routine. Despite being inhibited, your abs may actually have some trigger points that are contributing their dysfunction. Particularly, if you have excessive thoracic kyphosis (i.e. upper back rounding), you may find that your abs are particularly tender where they attach to the ribs. 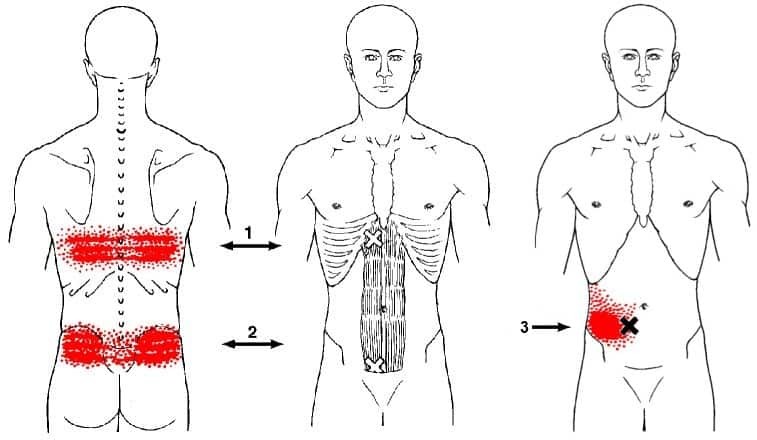 If this is the case, doing some abdominal release techniques can be effective in restoring function to the abs, while also improving thoracic spine mobility. Avoid postures that inhibit your abs for long periods of time. This means avoid standing or sitting with your lower back arched excessively. Cut down on sitting, in general, since this shortens the hip flexors, which reinforces lower crossed syndrome. When you do sit, sit near the edge of the chair. This forces you to activate your abs and sit up straight. The information in previous bullet points only addresses your abdominal inhibition to an extent. To fix the issue completely and permanently, you’ll have to address the larger problem of lower crossed syndrome, assuming you have it. Refer to how to fix lower crossed syndrome (article coming soon). Avoid ab exercises that involve bringing the ribs toward the pelvis (i.e. crunch variations). Instead, focus on isometric ab exercises (e.g. plank variations) or lower ab exercises that involve bringing the pelvis toward the ribs (i.e. reverse crunch variations). Release and stretch the abs (see above) daily, including before workouts involving any back exercises. Also release and stretch the obliques, if excessive thoracic kyphosis is your only postural issue. However, if you also have lower crossed syndrome or swayback posture, stretching the obliques is counterproductive since all or part of the internal and/or external obliques are already excessively lengthened. Increase training volume and training frequency on thoracic erector exercises. This means doing more row variations, and if you’re a more experienced lifter, implementing a good morning variation that targets the upper erectors (e.g. seated, round back, or upper back good mornings). Also increase volume and frequency on and scapular retraction exercises and lower trap exercises. Reduce the time you spend in a hunched over position. Avoid or modify activities that tend to put you in this bad posture. If you have to be in this position for long periods (e.g. at work on computer), get up every 20-30 minutes to move around or stretch, even if it’s just for a few seconds. The above points should help to noticeably improve your rectus abdominis imbalance. However, if upper crossed syndrome is at the root of the problem, you must correct for lasting results. See how to fix lower crossed syndrome (article coming soon). If you want to build stronger and more prominent abs, see below for my rectus abdominis training guidelines and technique tips. Doing just the big compound movements (e.g. squats, deadlifts) is not enough to maximally strengthen and develop the abs. You need to train your abs directly. This will allow you to progress faster on the big lifts because you’ll have much greater core stability and strength. I recommend training the abs directly 1-3 times per week. This can be done at the end of one your normal workouts. Or, what I sometimes do is dedicate a day to abs and cardio (or abs/cardio/calves/forearms/whatever). Keep in mind that you don’t want to completely kill your abs in one workout if you have to do squats or deadlifts the next day. Many lower ab exercises are often done incorrectly. The number one mistake I see is a failure to make the abs actually perform their function of spinal flexion. This defeats the purpose of the exercise, since the abs only end up being worked isometrically. For example, on the hanging reverse crunch (often called hanging leg raises), people will correctly perform the first part of the exercise, which is to lift their legs up using hip flexion. But they fail to perform the final and most important part of the exercise, which is slight flexion, or rounding, of the lower spine. This second part of the exercise is where the lower abs are actually targeted; without it, the exercise becomes a hip flexor exercise that indirectly works the abs through isometric contraction. The most common mistake I see on upper ab exercises – particularly on lying crunch or sit up variations – is jutting the head forward. You’ll see this happen whether the hands are behind the head, crossed over the chest, or down at the sides (though the worst form is seen with hands behind the head since the tendency is to use your arms strength to pull your head forward). I think this technique mistake is the result of (unconsciously) trying shorten the range of motion. However, you don’t work the abs by doing crunches with your neck! Not to mention, bending your neck forward like that could cause or contribute to forward head posture, neck muscle strains or even disc issues over time. Depending on the source you look at, the muscle fiber type composition of the rectus abdominis is either slightly slow-twitch dominant (55-58% slow-twitch vs 42-45% fast twitch: source) or slightly fast-twitch dominant (46% slow-twitch vs 54% fast-twitch: source). And of course, the actual ratio varies from person to person. Whatever the case, the abs aren’t much different from most other muscles in terms of how they respond to different training stimuli. Generally, I recommend doing some heavier work (e.g. 5-8 reps) in addition to some lighter work (e.g. 10-15 reps; no more than 20 reps). Doing super high reps is mostly a waste of time. However, I’ve found that isometric ab exercises (e.g. planks) done for 1 to 2 minutes can help improve your ability to keep your core tight on moderate to higher rep sets of squats, deadlifts and rows. Do some direct oblique work along with your abdominal training. Both of these muscles work together to perform many movements of the spine and pelvis. Accordingly, you should train both groups to prevent a muscular imbalance. However, you may want to limit the amount of heavy low rep oblique work you do, since this tends to cause a lot of muscle growth. Excessive muscular development in the obliques will cause your waist to become wider, which is a bad thing if you want a strong v-taper look (i.e. broad shoulders and back with a narrow waist). Even if you have no noticeable strength or muscular imbalances affecting your abs, doing some occasional soft tissue release on them can only help to maintain healthy tissue quality. A couple times per week, I’ll lie down on the floor with my knees bent and feet on the floor. Then I’ll dig my fingers under ribs, applying pressure along the top of the rectus abdominis where it attaches to ribcage. This technique also targets the commonly-dysfunctional diaphragm muscle, which is often the source of dysfunctional breathing patterns and poor core stability. I always feel more relaxed after this and I am able to take noticeably deeper breaths. As mentioned in the first part of this “Training Notes” section, you should avoid upper ab exercises if you have an excessively kyphotic thoracic spine (i.e. too much rounding of the upper back). If you have a flat thoracic spine (i.e. not enough upper back curvature), you should put most of your focus on upper abdominal exercises. This should be done in addition to mobility drills for improving thoracic spinal flexion range of motion. Note: A flat thoracic spine is much less common than excessive thoracic kyphosis, but it occurs enough to mention it. If you have spinal disc issues (e.g. bulging disc, herniated disc), it may be wise to avoid both upper and lower abdominal exercises, and stick to just isometric abdominal strengthening exercises. The reason for this is that both types of movements involve flexion of the spine, which can be detrimental when there is already damage to your spinal discs. Of course, this is a general suggestion and not necessarily suitable advice for everyone with disc issues (only your doctor or physical therapist can give you individualized advice in this regard). In order to clearly see the development of your abdominals, you need to be at a low enough body fat percentage. For most guys with decent muscular development of the abs, they’ll become faintly visible around 15% and very visible around 10%. For women with good development, the abs should become faintly visible around 20% and very visible around 15%. These numbers, of course, can vary greatly from person to person depending on how someone’s body distributes fat.